Hi, I am interested in your 1957 Ford Fairlane (stock #4742-CHA) listed on Autotrader for $34,995. I'd like to get more information about this vehicle and confirm its availability. This is the cool classic hardtop with some desirable performance secrets. And as you dig into all the details on this restored 1957 Ford Fairlane 500, youll also discover all the best upgrades, including cold A/C. This car is quite striking from the first impression, and its no accident. This coupe has been under the same familys care since the 60s. It was restored in 2010, and has gone less than 2,900 miles since then. So it retains the crispness that came from carefully restoring a heirloom. But while that tells you about the quality, whats going to really seal the deal for you is the way this one is presented today. This was restored with an eye for a very cool performance story. It was painted in Highland Green and Wimbledon White. These are the kind of colors made famous by the Bullitt Mustang GT and the Shelby Mustang GT350s. Those wide exhaust tips and Shelby GT-H alloys complete this performance look. Even if you werent impressed with the subtle aggression, the workmanship of this coupe certainly will. The front end has a mirror-like chrome bumper thats complemented by the custom grille and upgraded HID headlights. The rear has even more great chrome, and 57 was the debut of true tailfins. Along the side, the stainless trim creates a separation line for the white and green. This full-length silver and gold streak needs truly straight sheetmetal for it to make this kind of stellar impression over the whole body. So this is a classy classic with a performance story to tell. Inside, the color theme continues as green and white are expertly interwoven with a tasteful gold streak for accenting. While this is part of a custom creation, its also quite mindful about keeping the vintage appearance just look at the detailed presentation of places like the tweed seats, correct trunk, and the classic steering wheel. So youll love rolling down all the windows to show off the interior of this hardtop coupe. As Fords full-sized offering, theres plenty of room to take family and friends along for the ride. And there are even nice upgrades like modern stereo/iPod inputs and cold-blowing air conditioning. But as you slip behind the wheel, youll also notice the upgraded Dolphin gauge package. It tells you theres something special under the hood even before you twist the key and hear it roar. Youll love tilting the hood forward and showing off this tidy and bright engine bay. This is a D-code coupe, which means it came with the optional Thunderbird Special 312 cubic-inch V8. Not only does it still have that displacement today, but this was one was built by the specialists at Godwin Singer Machine Shop. That means it has all the right performance components, including a desirable ECZ-B intake, Edelbrock four-barrel carburetor, custom grind Mummert Y-270-S performance camshaft, and Reds headers that add power while also contributing to the sweet-sounding glasspack dual exhaust. 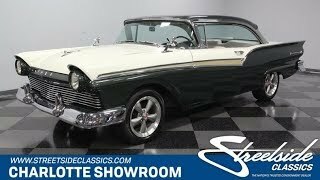 This Fairlane rides nicely, like a good full-size Ford should, and you even have the Ford-O-Matic three-speed automatic transmission to keep cruising easy. But with all this added V8 power, youll appreciate upgrades like the four-wheel disc brakes and the modern grip of Pirelli P-Zero Nero tires. The sale comes complete with paperwork like title documentation, restoration photos, maintenance records, and build receipts. Its the cool and unique classic with a story to tell. So if you like standing out in all the best ways, dont miss this coupe.Call now!